Continue the push to have the remains of our soldier returned. Remind everyone that many of our servicemen are still on foreign soil. Organization such as the American Legion still work hard to see that this cause is kept a priority and believe it or not, remains are still being brought home. Show your support with either a flag or with one of our many POW/ MIA Commemorative Items. Choose from a range of items like garden flags, lapel pins, reflective decals and embroidered patchs to spread the message to bring our service personnel home. 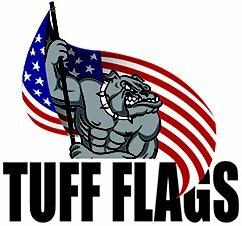 Tuff Flags will make available to you the best prices, quick shipping and much more! 100% customer satisfaction guaranteed! 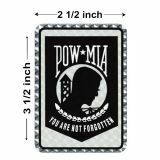 POW/MIA Embroidered Patch - 2.5"x3.5"
POW/MIA Reflective Decal- 2 1/2"x3-1/2"
Fly our POW/MIA Single Reverse Garden Flags to show your respects to soldiers that have gone missing in action or become prisoners of war. Digitally printed on high-quality domestic nylon using high quality inks, the imprints of these flags are visible on the reverse side as well. These durable and all weather outdoor flags are made of 200 Denier Nylon fabric. 100% Made in the USA. Our POW-MIA Flying Flag Lapel Pin features the image of POW/MIA flag, a silhouette of a man's head with a barbed wire fence and a watchtower in the background is another way to promote the efforts to bring back the remains of our American military. 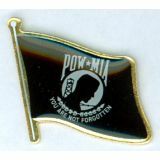 Tuff flags have a range of POW/MIA Lapel Pins to show pride and support for this cause or organization or as handouts during national events and holidays. Looking for something simple? 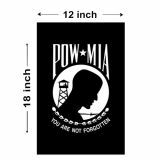 Consider these 2.5"x3.5"reflective POW decals or embroidered Patchs that remind us of the selfless service and sacrifice of the military personnel. 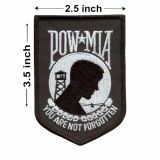 Browse our inventory of POW/MIA items to choose something that meets your needs. 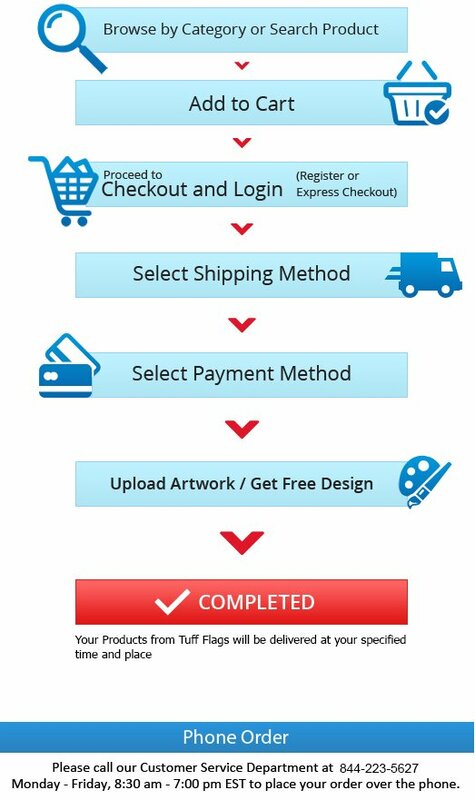 Should you need tips, just call us at our toll free number (888) 287-3524 or email at customercare@tuffflags.com and we shall walk you through the ordering process.